At the end of May, an Illinois attorney was invited to join a national professional association for lawyers who serve their communities. It was an honor for Lindsay Rakers to receive this prestigious award, being selected as the top 1% of attorneys in the nation as recognized by the National Association of Distinguished Counsel. 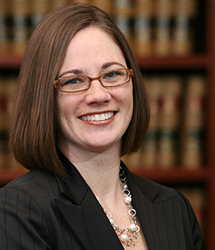 Tapella & Eberspacher, LLC attorney Kara "Lindsay" Rakers was officially welcomed into the National Association of Distinguished Counsel after a rigorous review. The prestigious legal organization comprises only the nation's top attorneys, and less than 1% of practicing U.S. lawyers are eligible for membership. Rakers was formally notified of her acceptance into the legal group on March 4, 2015, and following a lengthy nomination and vetting period the Charleston lawyer officially joined the organization as a full member in May. Rakers is a personal injury lawyer and was previously inducted into the The Million Dollar Advocates Forum, a professional group for trial lawyers. “It was an honor for Lindsay Rakers to receive this prestigious award, being selected as the top 1% of attorneys in the nation as recognized by the National Association of Distinguished Counsel,” said Rick Hall, the business manager of Tapella and Eberspacher. According to the association's website, "The mission of the NADC is to objectively recognize the attorneys who elevate the standards of the Bar and provide a benchmark for other lawyers to emulate. By virtue of the incredible selectivity of our research process, only the elite few are invited to join the ranks...The recipients of this prestigious award have demonstrated the highest ideals of the legal profession." National Association of Distinguished Counsel membership grants attorneys access to an array of business services designed to enhance their legal career, such as the Legal Research Center, which provides customized research and a legal resource library. After an attorney or client nominates a candidate for the National Association of Distinguished Counsel, a research team reviews their professional history, client reviews, peer endorsements, professional awards, case history, and community involvement. Candidates who pass through this extensive review are then hand picked by a group of former judges, and only those who demonstrate "admirable character and virtue" are selected for membership. Rakers will be featured in an official profile on the association's website to recognize her contributions to her community. Tapella & Eberspacher is based in Illinois and handles cases throughout Illinois and St. Louis Missouri. Their lawyers have experience in a wide range of cases, including personal injury, nursing home negligence, medical malpractice, business law, truck accidents and more. They offer free evaluations to help potential clients determine whether or not they have a legitimate case worth pursuing. To learn more about their experienced legal team, visit http://www.foryourjustice.com or click here.